MOTO-D Strapless Transport Stands are the original motorcycle trailer restraint system used to secure your motorcycle without the use of wheel chocks, straps, or tie-downs. The MOTO-D STStands consists of an upright tower bracket that secures the motorcycle by locking in a steel rod inserted through the hollow rear axle of the bike. No stress on your suspension. Loading and Unloading a Motorcycle into the MOTO-D Strapless Transport Stands takes approx. 1 minute or Less. If you are towing a motorcycle with a trailer, the MOTO-D STStands are the easiest to use motorcycle towing device that is removable in seconds when not in use. Installation of the Strapless Transport Stands consist of bolting two mounting plates to the floor, then sliding the restraint stand into place and engaging the locking mechanism. The MOTO-D Strapless Transport Stands is a motorcycle towing device (apparatus) that works great in enclosed trailers, open trailers, shipping crates, cargo vans, long bed pick-up trucks, etc. Q1. Are the Strapless Transport Stands (STS) Removable? A1. Yes, the STS has two base plates that bolt to the trailer floor, and the stand is locked into those mounting plates. The STS can be installed or removed in less than 30 seconds. Q2. Can I haul different bikes (make,model,year) in the STS? A2. The main frame part of the STS is the same for all motorcycles, the only part of the system that varies from bike to bike is the Axle Bar. You will need the appropriate Axle Bar Kit for each motorcycle you plan to haul. Q3. What if I buy a new motorcycle, will I still be able to use my STStand? A3. Yes, as long as your new motorcycle is listed on the “Fitment Page” of our website. You may need to buy a new Axle Bar to work with your new motorcycle. Q4. What holds the front of the motorcycle while in transit? A4. Because the STS holds the motorcycle securely with a bar through the rear axle there is no need for any other restraints. The motorcycle cannot lean, and the front cannot move side to side, so there is no need for a wheel chock or tie-downs. Q5. Can I load my motorcycle facing backwards? A5. 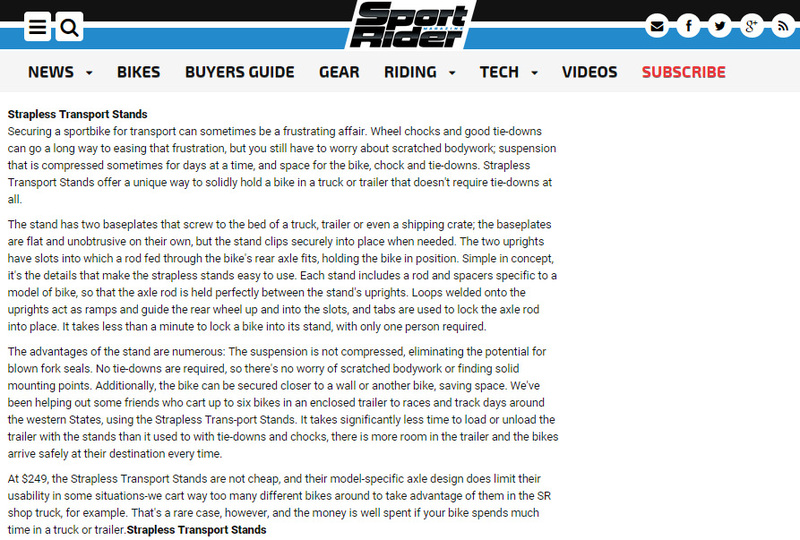 YES, you can mount the stand to have your bike facing backwards, forwards, or even sideways. Q6. Can I load my motorcycle by myself (one person)? A6. YES, this system will allow you to load and secure your motorcycle easily with only one person. Q7. Does hauling the motorcycle with a bar through the rear axle damage my bike? A7. NO, the rear axle is one of the strongest parts on your motorcycle. The Strapless Transport Stand is a new idea for the masses of Track Day Riders and Club racers, but the Factory race teams all the way up to MotoGP use some type of Rear Axle Support Stand when transporting their bikes. Q8. Will my bike bounce up and down during transport? A8. Your motorcycle will ride on its own suspension, and will act very similar as to if you were riding it inside your trailer while driving down the road. Q9. Will the Strapless Transport Stand work on a different bike from the one I bought it for? A9. The main frame part of the STStand is the same for all motorcycles, the only part of the system that varies from bike to bike is the Axle Bar Kit. You will need the appropriate Axle Bar for each motorcycle you plan to haul using the STStand. Q10. Can I buy additional Mounting hardware OR Spare Parts to be able to use the STS in more than one trailer? A10. YES, you can order additional mounting kits which include a pair of mounting plates and all need hardware (bolts, washers, nuts). Nearly every part of the stand is available for replacement incase of loss or damage. Visit the "WHICH BIKE? / PARTS" Drop Down Menu above and scroll to the bottom to select the replacement parts you need. The product is very easy to install and very easy to use. It's solid too. Way better than using straps. Very cool product. Super easy install. Worth the investment. I know that there are some other products out there, but I like this one more because of its relative ease of use, and super small footprint in comparison with some other products. Every cubic inch of space matters with a trailer. Just wanted to let you know that I took your advice and went for the STS. I am happy to add more of your products to my collection. 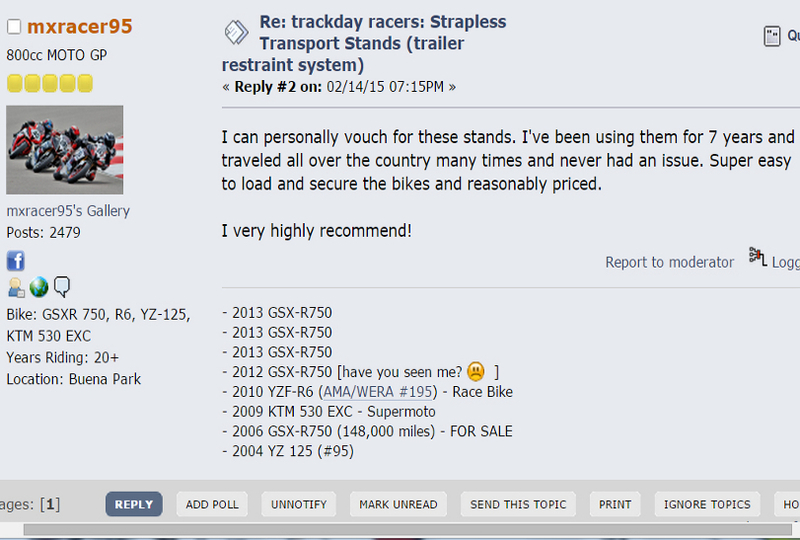 Click the button below to add the MOTO-D "STS" Strapless Transport Stands to your wish list.